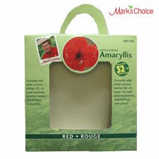 The Mark’s Choice Amaryllis Kit comes complete with a decorative ceramic planter. My amaryllis are guaranteed to bloom. The bulbs are super-sized and 28% bigger than most of the amaryllis sold in Canada. This means bigger flowers and more of them.